London’s The Electric in Brixton is bringing a club show to the city for one night only as dance legends Faithless, featuring Maxi Jazz and Sister Bliss, will DJ and play a live PA with many others on May 31. 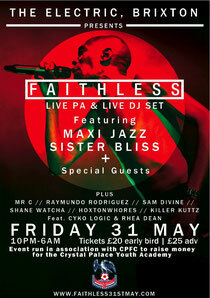 This is Faithless' first UK show since 2011 although recently they played at the US festival Ultra. Faithless are known the world over for their anthemic, stadium filling dance sounds, brooding vocals and epic breakdowns, best known for their dance anthems like ‘Insomnia’, God Is A DJ’ and ‘We Come 1’ and recorded an impressive six albums. During their career they sold over 15 million records worldwide and their live show is something special with amazing production, lights and lasers all adding to a true and original dance music experience. Also playing will be SuperFreq boss Mr C, Shane Watcha of Zombies Ate My Brain, Raymundo Rodriguez, Sam Divine and Hoxton Whores.